A part of Florida's Big Bend, Cedar Key's fishing reputation is well known! The elusive and delicious redfish are a favorite! Whether you fish inshore from our dock or offshore for grouper, cobia, and what have you - Cedar Key is sure to please most any fisherperson. Known as one of Florida's "Other Keys", Cedar Key is a magnet for gamefish species throughout the year. The grassflats are extensive and many an angler can attest to the deeper holes around the edges of the flats. Kayak fishing has become ever more popular and we encourage you to experience the up close adventures of kayaking Cedar Key's shorelines. Highly Recommended! One of Cedar Key's own fishing captains is ready to take you out for a half or full day of fishing from the shallow flats of Cedar Key Wacassassa Bay, Steinhatchee and Crystal River. 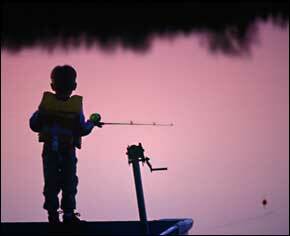 Fishing trips tailored to your needs. Check out their Cedar Key Fishing Charter website or their Facebook page. Check out Captain Dan's fishing services. We went fishing with him July 2008 and had a fabulous time! Caught lots of fish, told great fishing tales, laughed, and thoroughly enjoyed ourselves! Captain A.J. Brown Specializes in Flats and Backcountry fishing in Cedar Key, Florida. Want to learn the fine art of redfish catching? Read Chris Christian's tale of how to catch the elusive redfish in a river of bronze in the grassflats of Cedar Key Florida! Is that a snook on my hook? Florida Stone Crab Season Starts October 15! Stone Crab Season runs from October 15 to May 15. Bet you can't eat just one! Or five! Thanks to the Big Bend Florida Sportsman Guide - we have a link to the hot fishing spots in and around Cedar Key Florida! Check out this popular fishing spot in Cedar Key! Trout, redfish, and sheepshead! Watch out at low tide! Accessible only by boat - but a terrific preserve for the fisherperson! See the Cedar Keys boating page for more links! Do you know a great fishing link that you think we should add? Tell us!